Sales were phenomenal. I had wonderful repeat customers, and lots of new ones. I sold more sachets than I expected to and lots and lots of soap as well. Usually the next two weeks are my best, so I hope that this trend continues into next weekend. I did well enough that I am splurging on a new bird feeder that I adore from a potter down the aisle. I also get up a barter for a shawl pin, just beautiful and perfect for the stole I am knitting now. But all these sales means lots of work in the shop over the next few days. So I have to get going and get downstairs. Pretty good show today. I got to see a lot of familiar faces and lots of new ones. 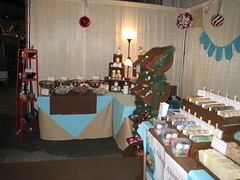 I was surprised by the number of shaving soaps I sold and the number of bath fizzys as well. I am gonna run out of some of those this year for sure. The stand it set up different than usual, so i have different space t work with. I found that I put the garbage bag too far away from me and I have no room to pack soap bags. i will need to move a few things around I think to give myself some more space. It always takes me the first weekend to settle in anyway..
Hope these strong sales continue. That would be great. On target for right now so that is all I can hope for. And I am doing GREAT!! My tummy is all better and I have lots of energy. C is helping by doing lots of the the shop dishes- cleaning molds and such, dad is cleaning the downstairs bathroom and wrapped fizzys for me, and I have made two batches of soap and gotten everything ready for the few things I need to do in the shop tomorrow morning. Lots of laundry to do and cleaning yet. But I am blogging because it is on my list f things to do and I want stuff CROSSED OFF ASAP!! Once I get done here it is on to vacuum the living room, moping, and cleaning the upstairs bathroom. Finishing the laundry, including the shop towels and the sofa covers, and then getting some packages together that need to be sent out. Then on to pack the van and Jeep and truck for tomorrow. It will take us at least three cars to get most of the inventory and displays over to the show. A lot of this is lighting, rugs, and decorations that I don't use for any other shows but this one. Once noon hits tomorrow we are setting up as much as possible, that way we can relax Wednesday night and Thanksgiving as much as we can. I feel good. Very accomplished and proud of myself. I have pushed hard and I have gotten a lot of work done and things prepared. I don't feel as behind as I have in previous years and I feel like I have done all I can in most areas. It is what it is. With only two day until set up, there are plenty of things I need to do. But I am really happy with how much I have accomplished lately. I am running low on supplies and have made everything I can make when it comes to most products. I only have a few last things on my list to do. I need to make some shampoo bars and shaving soaps, I have some bath teas to make, and some gift boxes of bath fizzys. I also want to make some soap on a rope. But these are all things that I can get to as the show goes on. 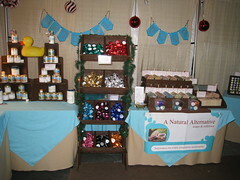 Bath teas are done except for labels, gift boxes just need labels, I need to make soap still, but that is about all. I am hoping that I will only have 3-4 hours of work tomorrow and the rest of the day I will be able to relax. Set up starts at noon on Wed and I will be there setting up. I figure 2 car loads Wed and 1 Thursday afternoon with the last of the stuff. My stomach has been killing me and I think it is partially nerves and also some stomach flu sort of thing. I went without eating most of the day today hoping to starve it out, but then got so hungry I jut had to eat. So after being up half the night last night, we will see how tonight goes. Right now I am chowing down on Strawberry Peanut Butter M & M's. Sort of gross and delish all at the same time. Kind of depends on how many I shove in my mouth at the same time, and i am glad I only have a little bag of them, because if it was bigger I'd eat the whole thing and then I certainly would be sick to my tummy. well, I am off. Going to try and put together a plan for tomorrow. Also plan on getting myself a nice glass of tea and a blanket. It is chilly in here! The 19th I had lunch with B. It was our last lunch of the year and we went over all the things we had accomplished during the year. Even with our busy schedules we still accomplished so much and came so far within this past year. I am very proud of us both. Then I drove to my mom's and cooked dinner. Friday was a day with mom, it was restful and rejuvenating for me. It was just running around, having breakfast, and watching movies. I got to see my nephew for a little while. Such a cutie he is! Saturday I had a home show at Becky M's. It went wonderfully! I hadn't done a home show in a while and I felt rusty and scared. It was great to jump in with a small group of ladies and in a place where I felt so comfortable and wanted. It went very well and I was extremely pleased with the entire adventure. After the home show I drove back home and dove into bed for a long night's sleep. Today, Sunday, is one of the last days I can work in the shop before Christkindlmart starts. I made both lemongrass soap and bath fizzys. I usually go by my production schedule, but these last few days I am going with my gut and making whatever I think is going to sell. I am worried about the set up later this week and don't feel ready. But I have to remind myself that I really have two days plus Friday morning to get things perfect. I am worried about lighting since I need to get all new lights and i am worried about floor covering, because I think I need some new rugs. I also am worried that some of the displays will fall into the background and I am not sure how I am going to bring attention to them. This summer I bought some great bath themed things that I hope to use in the display and make it more whimsical than usual. There is still lots to do but I feel like I can get it done. Whew, wasn't sure it would happen! This time next week I will be spending the day setting up for Christkindlmart. So I have a bout a week left to finish everything on my to do list. I will be done with most of the soap, I may have to pour a mold or two of shampoo bars or soap on a rope. I desperately want to curl up and do nothing today. back to sleep. But I have to clean the kitchen and the bathroom, clean up the work shop, wrap and make more fizzys. And send out a couple of orders I have gotten. Not to mention returning phone calls and emails and needing to get an order form fixed and printed out. Lots to do today, gotta go start a list and give myself some focus. See where to start what what can go without being done. I finally got to making bath fizzys. I have always hated the process, but it wasn't so bad yesterday. It was sort of zen like. I would mix two batches of ingredients, and then bang out almost 30 of them, then go back and mix two more batches of ingredients. In between I would stir soap and pour it into molds. my feet hurt more than anything because of having to stand for so long, but I got 3 (almost 4) fragrances done. That still leaves me about 800 or so to make, but I still have about a week to go, so they all should be done, no problem! The good thing is that I feel as though I have lots to do, but I am not overwhelmed. I was a few days ago, and even yesterday I had a stomach ache that just wouldn't let up. But now I am feeling like I have a handle on things and that it is what it is. There is just not more time or hours in the day. Just gotta do what I can and be happy with it. What a great little show. Sales were strong, the other crafters/artisans were excellent. Wonderful people, wonderful setting. I almost wish sales were slower so I could have gotten to know my fellow artisans better- almost. Load out was kind of a pain because the doors we loaded into were blocked by artisans on the way out so we lugged down stairs instead. We could have had the doors opened but we felt that by the time that was an option the stairs were just quicker than moving the car. This show is invitation only, but I highly suggest if you get invited as an artisan, do it. and if you love craft and art fairs as a customer- this is one you have to track down next year. This show to me is like the Philly Folk fest- I will be here every year they invite me but because it is so small, there needs to be a high turnover of crafters to keep the public interested. It is the only way it will stay vibrant and growing. On the way home a deer came out of nowhere and we hit it. Luckily no one was hurt (including the deer than ran off) and there was minimal damage to the car- just a crack in the bumper, and maybe one in the windshield. Overall for an encounter with a deer it wasn't as bad as I had expected. I figured the bumper would be crushed and the headlight smashed, but just a crack and deer dung to wash off. Guess we scared the poo out of the poor thing. By the time we got home I was exhausted and sore. Took a few aspirin and watched some TV and then went to bed early after fast forwarding through the NASCAR Race. Looks like poor Mark Martin will come in second again, always the bridesmaid, never the bride. Bummer, the man deserves it. Well, got to get going. Lots to do today. Get more soap made, get bath fizzys made, get my shop cleaned up, fix up the web site some.. all the fun stuff. TTFN! The barn is BEAUTIFUL inside. What a stunning place to have a show. I could not sell a thing all day and be happy to sit in that barn all day and take it in. It was a little like being in a church for me. I got to set up in a corner, which I really liked because I get to sit and look out at the whole show during the day. Dad and I got set up and I made a list of things I needed, including lights, my corner was a little dark, and we went home. I packed up everything I needed and C got home from his business trip. The rest of the afternoon was spent catching up with him and going to bed early for some well deserved rest. Saturday C and I arrived and set up the lighting and put out inventory. He ran and got me some paper bags and he surprised me with some chocolate and some coke. He figured I would need the caffeine if the show ended up being boring. Which it didn't. What a nice little show. Even being in the middle of nowhere lots of people came and bought. I got to see a few friendly faces that I recognized and got to meet a lot more. It was busy just at the start of the show and didn't really slow down until 3 pm. It was a steady stream of people. Not the most attended show I have been too. But overall I was happy with my sales and the overall show seemed successful for everyone involved. Yesterday was Rejuvenation day. It is always one of my best sellers so I made as much as I could before running out of essential oil. Dad and I also worked on sachets. Just a few more hours and we should be done with them for this year. They are like laundry- I have some to make every week and I tend to let them all pile up till the end of the year and then have thousands to make all at once. I should try and stay up on them throughout the year, and last year I vowed, and failed, to do this. I think in 2010 I will designate a sachet day each month where I will get them worked on and nothing else, maybe that will help. I have a new show this weekend. I really hope it is as nice as it seems to be. The November Sale takes place in a renovated barn and is only a small number of crafters (like 10 or so) that have been hand chosen by a local glass artisan. The quality of the work should be exceptional and I am really hoping that the turn out is great. I have gotten quite a few hits on the site from my newsletter, so I want to see some friendly faces!! But I have a back up plan if it is slow- I have some more face scrubbers to finish and I should be able to get some work done on the web site as well. Can't take the chance of wasting time right now with so much to do. Well it is 6 am. Time to finish today's To Do List and go and do some morning yoga. Then a few things in the shop, and off to set up for the show. Yesterday was a mental health break. I started the morning early making sachets and then went shopping for essentials: like milk and cat litter. I went to WalMart- where I rarely ever go, but when I do only pre 8 am so I can stand it, and looked for rugs for my Christkindlmart display and couldn't find anything I both liked and could afford. When I got home I just had an overwhelming desire to bake. Now I rarely bake. I love to cook, but not bake, and since going gluten free baking has gotten even farther down on my list of things to do because I have no desire to experiment with xantham gum and rice flour. But I have been collecting a shelf full of gluten free baking mixes. Many I have been given and also many I have just picked up along the way so if I do have a craving I can try and make something. So I started with brownies. I started with the new Betty Crocker Gluten Free Brownie mix and added a cream cheese top. I should have used a smaller pan so the brownie was thicker, put overall, pretty good. Next was the Bob's red mill GF Bread mix. Much better than the $10 loaf of GF bread I bought from a GF bakery a few weeks ago. Nit sure how it will be in the next few days, but warm and out of the oven was pretty yummy. And finally chocolate chocolate chip cookies. I used the Trader Joe's brownie mix and the recipe on the side to make them cookies. I used Dark chocolate chips. Very good. Better as cookies than as brownies I think. This baking spree was all over by 1 pm, and I started to vegetate. I started looking for shows into 2010 and printed out a calendar and wrote in what I wanted to do next year. There are a bunch of new shows I want to try. But I need to take a good hard look and make sure I give myself time to do the things I need to do around here. Balance- I need to find balance..Next year's schedule will take more work, but it will be nice to try new stuff. Tuesday have been odd for me the last few weeks. I have been taking B to an afternoon Dr apt and then we have lunch and assess our goals for the week. So what has been happening is that Tuesday becomes sort of a day off, or a me day depending on the week. I really like this as it gives me some time to re-energize, but I have had Monday to get a load of things off my mind and done, so I really can enjoy the day. Yesterday while I was gone dad finished up some laundry for me- I had to wash my table covers because at the last show someone let their dog with muddy feet put them on my table, so I had paw prints everywhere. He also finished washing my tent sides so they are clean and ready for next year. And shop towels wee washed- I always have lots of dirty shop towels that need a good washing. In the morning I got some paperwork done and I started cleaning my bathroom, since we will have a guest soon. I got my jewelry box uncluttered and in order. It was driving me nuts having to search for earrings. I also got the layout for Chriskindlmart finished. I have some idea what tables I want to go where, now all I have to do is try and figure out display locations. And of course this will probably all change the moment I get into the space, but at least it gives me a place to start and idea of what size rug I need to buy. Then it was off to the Dr, and lunch. On the way home I meant to run errands, but it was already getting dark out and I just wanted to go home. So i picked up the mail and wandered home, for the errands will be taken care of later. Well it has been a busy day. I got up early because C was flying out for work again. I started with lots of computer stuff- paying bills, running credit cards from the weekend's show, blogging, getting a bank deposit ready.. all that fun stuff. It was pretty late before I started making soap, I almost was going to skip the day, but then I realized I only had 10 more days available to make soap. Dad got the soaking wet rugs out of my van and got them dried out in the sun. He also cleaned off the tent and got that packed for the rest of the year. I peinted out the last newsletter for the year and dad got it folded and mailed out. Later he started labeling the last of the lotion bars that I made today. Beides soap and lotion bars I also got lots of equipment cleaned, laundry done, and a bunch of basic soap milled. By 5 pm I was exhausted so after my last batch of soap it was off for a hot shower, and a night of chilling. It's 7:30 now and I am ready for bed, just need to keep myself awake for a few more hours. Too tired to knit. Nothing on TV. So last week flew by again. 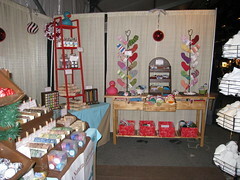 I had 4 days of craft shows: 2 down at WCU for a Woman's Symposium and 2 at Peddler's Village for the Apple Festival. First the Symposium. I love doing these corporate type shows because everyone is always so friendly and warm. I hoped that the Symposium itself would have attracted more people, thus more shoppers, but I didn't do too bad. I sold to a high % of people who passed into our craft are, there just wasn't a high volume of shoppers. The Apple Festival was very good this year. It seems to fluctuate in sales depending on the economy and weather, but this year has been one of my best in quite a few years. I didn't see some people that I usually see, but lots of new faces, so I really liked that. This show is just painful to do. You have to have ground cover, so I have to keep a rug just for this show, and you set up early, outside, so Saturday it was only 27 degrees when we arrived. I can't believe that a week has flown by so quickly! It is going to be a hard few months if time keeps on slipping by like this. Not enough time in the day. Over the weekend and Monday I worked in the shop. It was sort of hard to have C home and work with him here, but since he had so much stuff to do as well, it was OK.
Tuesday I brought B to a Dr. appointment and then we had lunch. Once again we reviewed goals and once again I got nothing on the web site done, so I owed her $1. Pretty soon it will be $5. I have to find some time to sit and work on it. UGH! Wednesday we sat around, I mean literally, not even out of PJ's kind of day. It was fun to sit and watch TV and knit some and generally chill. Thursday, Friday, Sat & Sun- back to work... Lots of soap made, lots of sachets. Got the shed cleaned and an idea f what I want/need for displays for shows for the remainder of the year. I still haven't started making fizzies. I wonder how much longer I can put the little buggers off... I guess till I am out and apologizing to customers.. and I don't want to be in that situation. Got Shows this week Thursday-Sunday. Busy busy and another next week, the week after that, and then till the end of the year. Got to make soap every day that I can in order to have enough stock. And I think I am going to keep working hard till Christmas to get myself ahead for next year so I don't find myself in this same situation. OK, back to work, go to pay bills and stir soap!